But when I started caring full time for my ill mum, who was housebound with myeloma and kidney failure, I must admit I stopped really caring for myself. She was my priority, and any salon visits fell aside. When I lost her this summer, I looked at myself in the mirror and barely recognised myself. My hair had grown like a weed beyond my shoulders, contained day-to-day in a crocodile clip. I would still use natural colour kits to hide those greys coming through, but I made no effort beyond that. 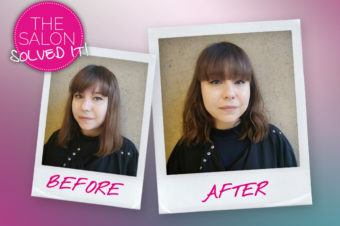 I knew I could donate hair to a charity such as The Little Princess Trust, which makes wigs for children who have lost their hair through illness and treatment, so I resolved to just let it grow until it was long enough to do just that. 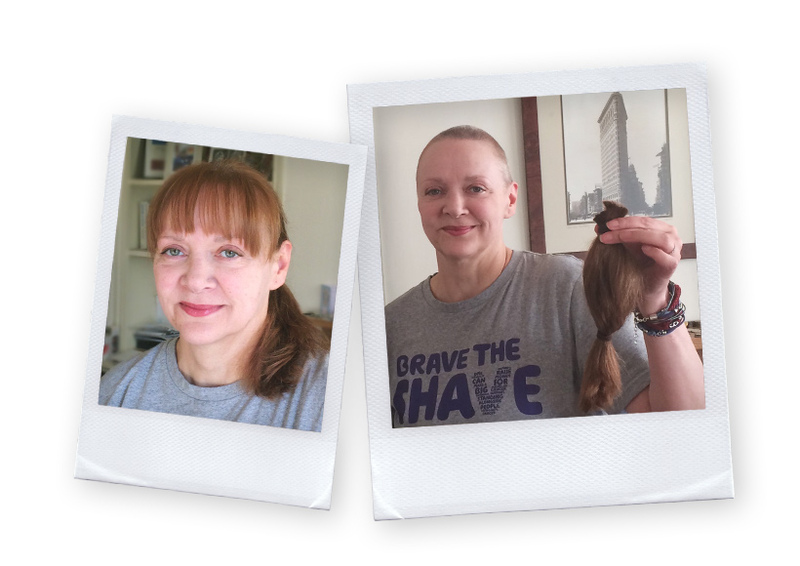 But then, a week after my mum’s funeral, I decided to do something a little more drastic – I saw an advert for Brave the Shave, a campaign that encourages people to shave their heads to raise money for Macmillan Cancer Support, and thought “Well, why not? I’m cutting off a load anyway, and it will always grow back.” Macmillan nurses had been such a help during both my parents’ illnesses that this seemed exactly the right thing to do. I set up online sponsorship, and by the time Shave Day arrived, I had raised £205. I was thrilled. I booked an appointment at my partner’s barbershop, Turnstyles in Oxted. 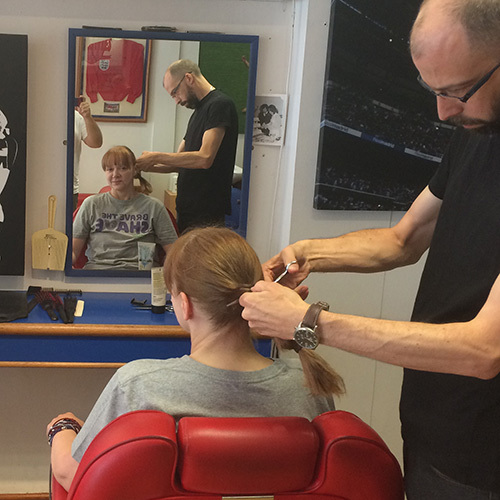 As a fervent West Ham supporter, this football-themed barbers is right up my street. 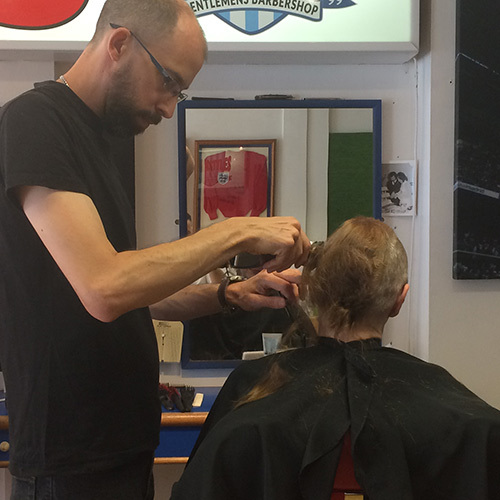 The 8” ponytail came off first to be collected for The Little Princess Trust. However, my barber James seemed hesitant once it was clipper time, but I assured him I was ready! And as he set the clippers at Grade 2, and my hair started cascading down onto the floor, I must admit a weight lifted. 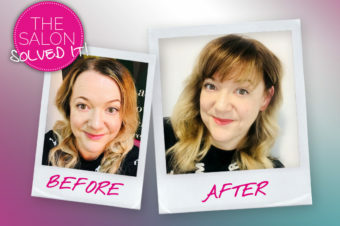 I was surprised how much I loved the freshly shorn me, and it was utterly liberating for a few days – in and out of the shower in a flash, no styling or blowdrying needed. Bliss! But then the grey that I had camouflaged before was out and proud, and it started to bother me. I was going to just put another light brown natural colour box dye on it when I thought “Well, I’ve come this far… why don’t we have some fun now?”. To be totally transparent, my sister Amanda is the editor of Layered Online, and she suggested bleaching my hair so that I had the option of playing with pastel colours, something I’d watched others do with envy. 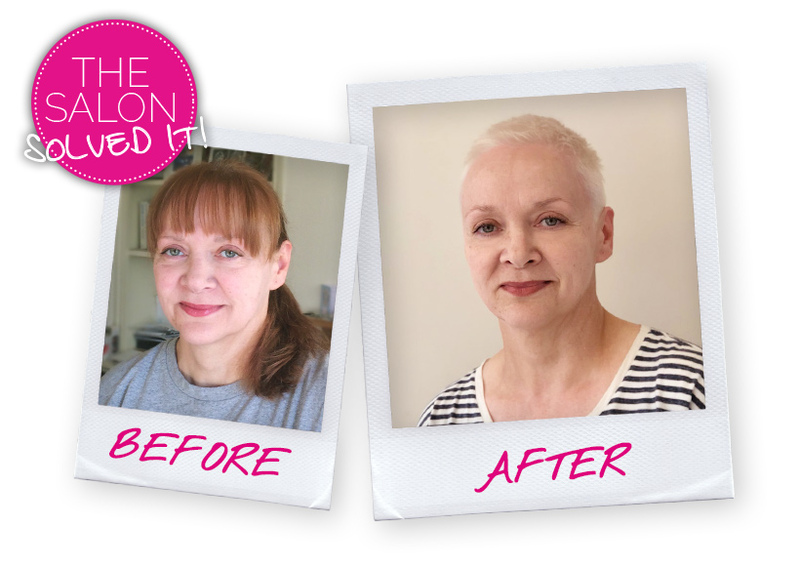 I loved the idea – and even if I hated the result, I could always just shave it off, couldn’t I?! 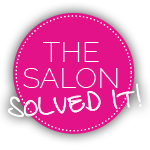 So I made an appointment with my nearest Trevor Sorbie salon in Richmond (brand loyal after 30 years!) 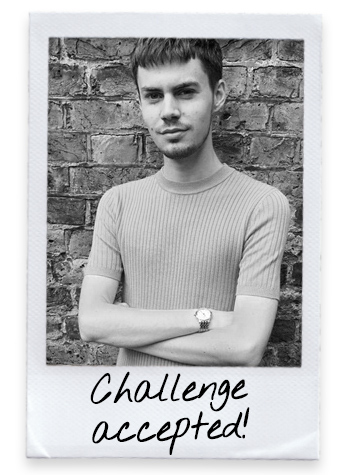 and explained to colourist Ryan (pictured, below), stylist Sasho and with help from Naomi, what I wanted to do. Were they up for the task? 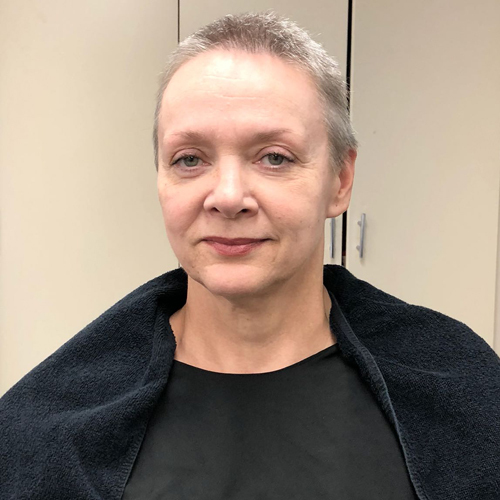 The staff in the salon were just lovely, and everyone seemed thoroughly curious as to what a 50-something woman with a shaved head was going to do! 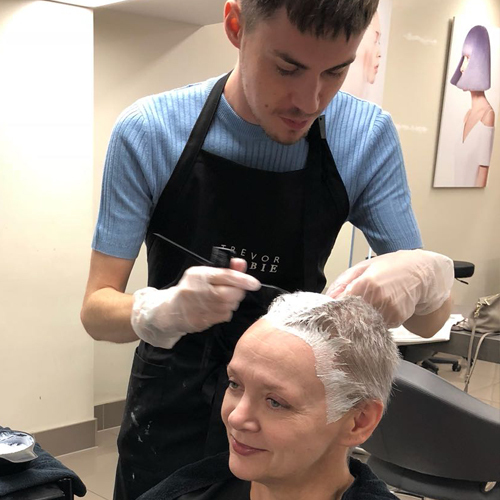 As the bleach sat on my scalp, I enjoyed a wonderful cappuccino and relaxed with some magazines – it had been such a long time since I had treated myself to time out like this, and it felt incredible. And no burning from the bleach either! I was astonished. 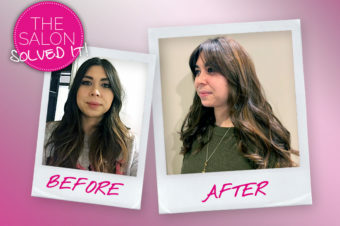 Once the bleach came off, I enjoyed a L’Oréal Professionnel Smartbond treatment at the backwash to help keep my little bit of hair healthy and damage free, and then it was toned to make it as bright as possible. Ryan explained that it was perhaps a little too short this time to put any pastels on top, but actually I was so enjoying the bold blonde result that I was happy to keep it just so. I sent a finished picture to my sister, who exclaimed I looked like Annie Lennox – thank you very much, sis, I’ll take that! Now, I’m Tracy again – but turned up to 11! I’ve got my mojo back, and while I’ll admit the upkeep of salon bleaches every three weeks might be out of my budget, I’m definitely going to play around more with colour and have some fun, and keep it nice and short. My partner Sean seems bemused by the whole experience, but I think he’s happy that I’m happy again. I’m playing with make-up, defining my eyebrows more to stand out against my white crop. This cut and colour has given me almost a suit of armour to help face all the admin now of sorting through my parents’ house and belongings. It’s amazing how some clippers, a bowl of creamy colour and some brilliant hair stylists can make you feel strong again.